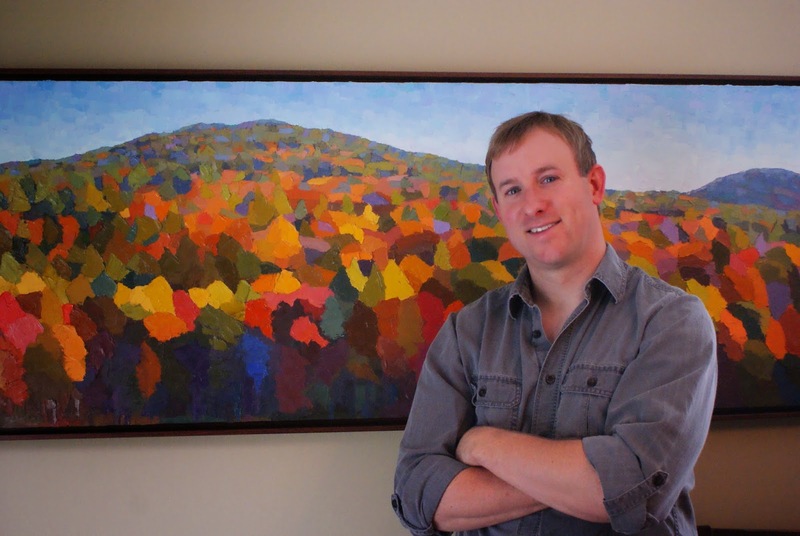 Brian Kiernan began showing at L'Attitude Gallery over four years ago, and in that time both we and his admirers have wondered about the affable artist behind rich, textured paintings of Northeastern landscapes. We've always loved how Brian's abstracted style makes places feel majestic yet familiar. On his recent visit to the gallery, we sat down with Brian Kiernan to learn more about his journey as an artist. We're pleased to share with you the interview that followed. I was in a very bad car accident as a young adult and broke my neck. The recovery was a grueling process and left me with limited mobility for some time. I eventually found my footing through making art, which fueled my desire to recover. Ever since that incident I have devoted myself to being more fully aware of my surroundings, and that is when I began to feel a deep urge and commitment to make art. When I was young I was always making things and working on projects. It didn't matter what kinds of materials I had at hand so long as I could get lost in the making of something. Year later, after having gone through art school and maintaining a professional studio for over a decade, I am still basically the same. Art is a profession that requires you to roll up your sleeves and get lost in the work. Growing as an artist means getting in as many hours as you can in front of your work. During the course of painting, my perspective towards nature is constantly changing, which pushes the vision further away. I enjoy the pursuit of something that is elusive. Dusk in the Great Gulf Wilderness, 36" x 24"
Why landscape as a subject? Nature is overwhelming. Every aspect draws your attention while the light is ever-changing, and it is so easy to be seduced by the surfaces I paint. It is truly impossible to capture all the nuances of a place. For me, working from the landscape is a document of my struggle to absorb it all and create from it. I am less concerned with trying to replicate a place and more interested in portraying a representation of my experience with nature; my perceptual struggle. The process of looking is a crucial part of my subject, which I try to put into focus with a sometimes heavy buildup of marks which constantly evolve in shape and color. I hope that my paintings are able to convey a sensation of place as well as a history of the visual search that took place during my process. Have you had any interesting commissions? Most of my commissioned paintings have gone according to plan. I can remember finishing a very large painting for a client who requested the addition of a mountain lion after being presented with the finished piece. The animal would not have worked well in the painting, and I politely declined to add it by saying that it would be truer to form to imagine the lion stalking the viewer from a good hiding spot (probably behind the viewer). These unique challenges are what make commissions exciting. Whether it is reworking a composition, painting in a different format such as a triptych, or just plain working LARGE, I always welcome the opportunity to paint something a little different. What is your favorite painting at the moment? Cliché, but the answer is usually what is on the easel at present. The promise of a current painting always holds my attention more than a completed work. Thinking back, my personal favorites have more to do with the experience of working on them rather than their success as finished works of art. I can remember working on a winter landscape years ago... It began to snow, and it looked like the fake snow in a movie with these big, slow-moving flakes that hovered rather than fell. The painting need something and that was it! I worked in the snow and even went so far as trying to mimic the large flakes that were landing on my glasses. Snow gave the painting real depth and was a nice little breakthrough as well as a memorable experience for me. Who do you see as your primary audience? 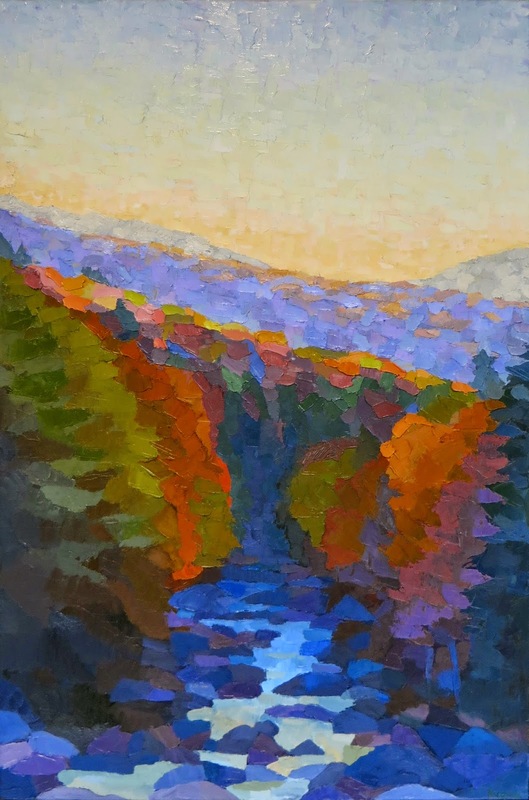 When I am painting in the mountains, I am constantly meeting people out rock climbing, hiking, and just taking part in the spectacle of it all. I think people will always feel the need to connect with nature. I hope that anyone who has an affinity for wild places may find some spark or connection to the environment in my work. You have also worked at Harrison Gallery in Williamstown. Has working at a gallery influenced how you approached your relationship with galleries as a painter? Having seen the amount of work it takes to run a gallery and sell artwork, I want to be easy to work with. Whether that is being prompt on email, open-minded about projects, or delivering works at a set time, I hope to keep up my end of the bargain by painting often and being professional. With all the quality artwork being made today, I am lucky to have someone willing to show my work. Painting is a somewhat isolated profession, so having a gallery and people willing to look over the work and give me input/suggestions is very helpful. Can you give us a preview of what's in the works for your newest series? What's on my mind: mountains and Cezanne. Patterns and subtle shifts. The urgency of Tom Thomson's paintings. Surfaces with thick paint and more mark making balanced with more dissolved forms in space. To see more examples of Brian Kiernan's recent works, visit his page on our website, or stop by the gallery to see them in person. If you have follow-up questions or comments for Brian, please leave them below or email us and we'll get back to you!